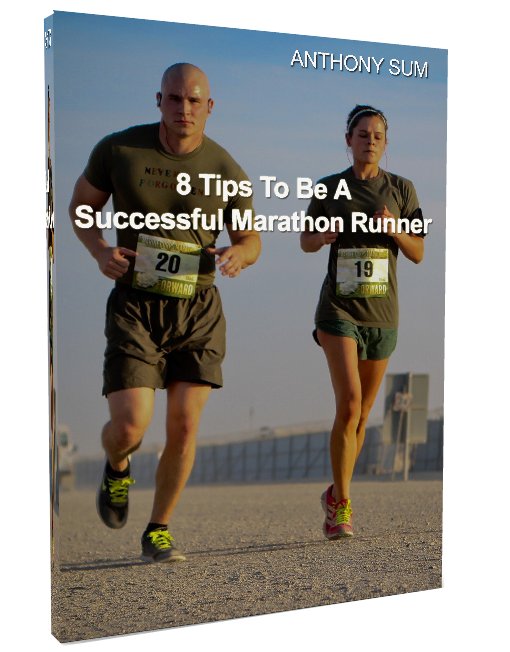 You have put in your best during all those lead up and training runs…The moment is nigh for Show Time! 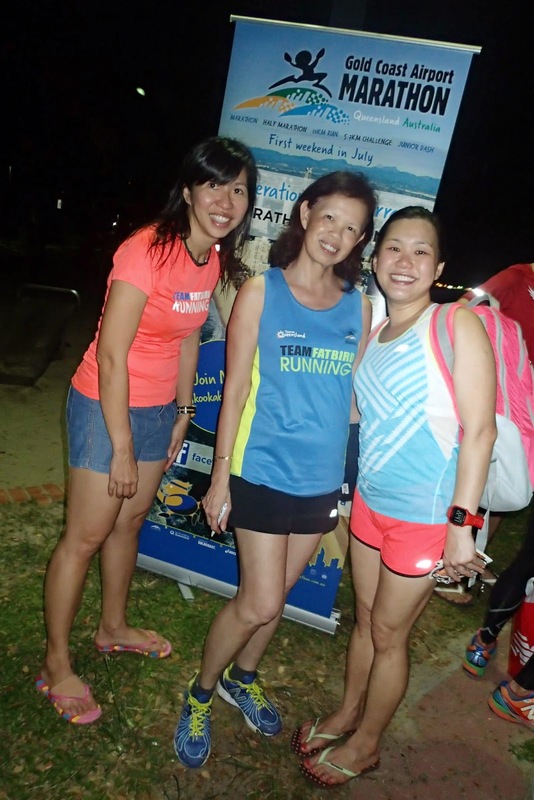 Join us @ SundownMarathon 2014 Pacers & Runners – Race Night Meet-Up? for our momentous journey through the Sundown Finish Line! 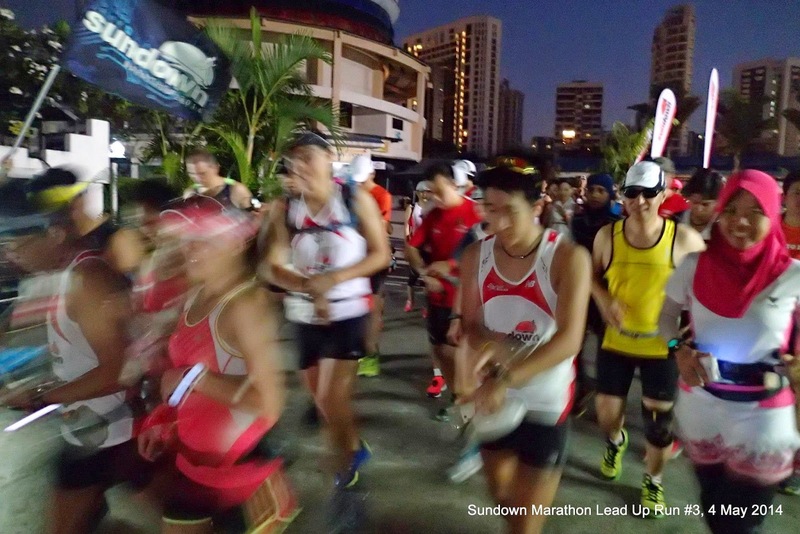 Sundown Marathon 2014 Lead-up Runs from Ivan Lau on Vimeo. 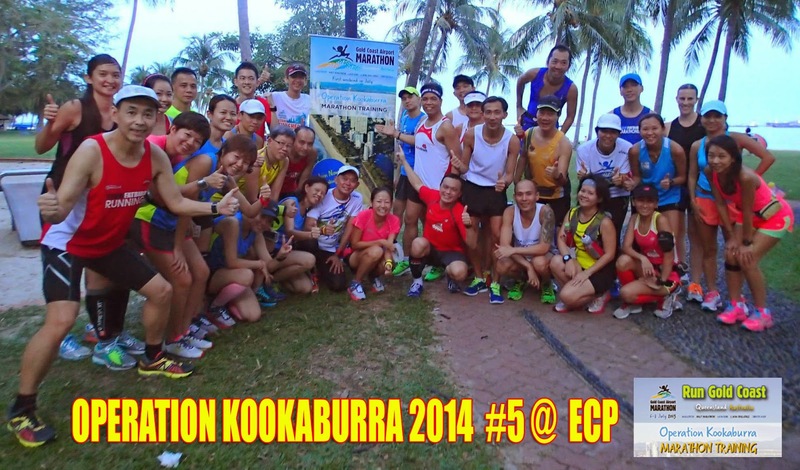 This morning saw the 2 training groups from Ops NightHawk (Sundown Marathon) and Ops Kookaburra (Gold Coast Marathon) gathered at the Playground @ ECP for their respective group training long runs. While the NightHawks were into their final 2 weekends of long runs, the Kookaburras were just about entering the mid-way of their training program, with 7 weeks of training remaining. Both training groups were early as the NightHawks collected their finisher race singlet, while the Kookaburras collected their bright-red race singlet for qualifiers based on attendance requirements. The group briefings and photos were kept short to achieve a nice start time of 7:15am. 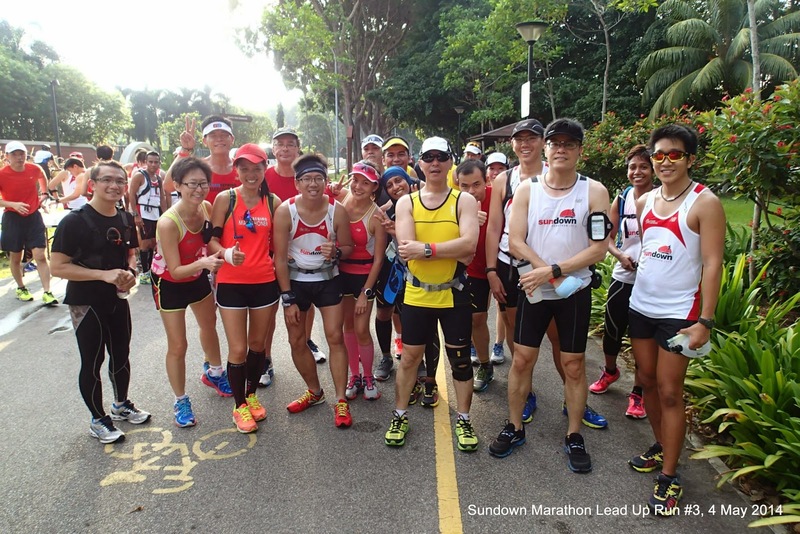 The respective pace groups soon settled in with familiar faces amongst each of the groups, chatting and catching up on events and training of the past few weeks. 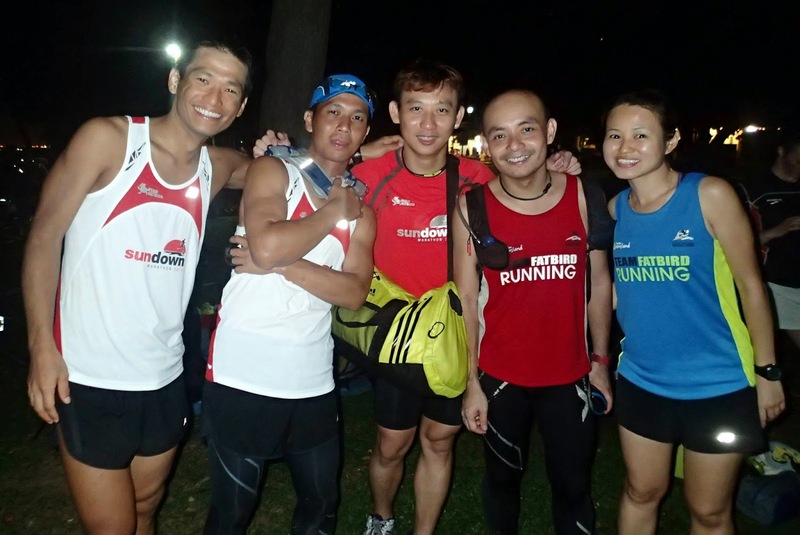 The NightHawks were in cheery mood and high spirits as they have only 15km (HM) and 25km (FM) to cover during this tapering phase. 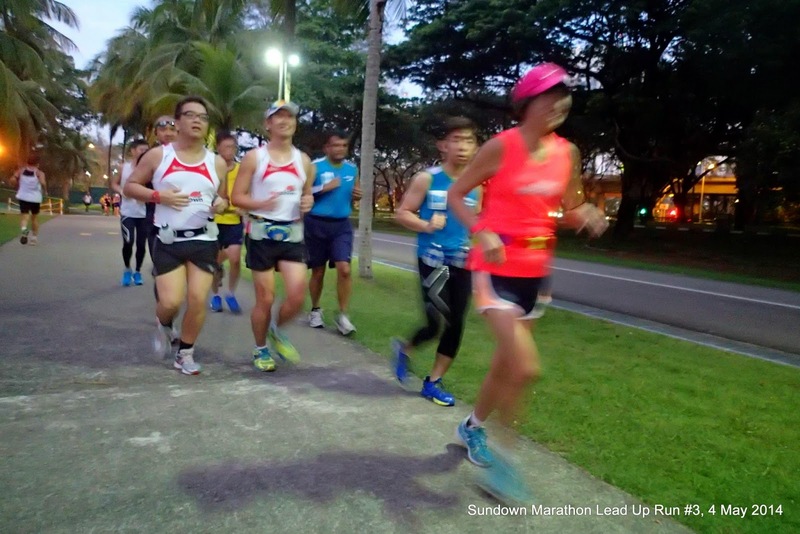 The Sundown Pacers were also putting their final race night plans into practice, with some fine-tuning and tweaking to even out any creases in their teamwork and formations. 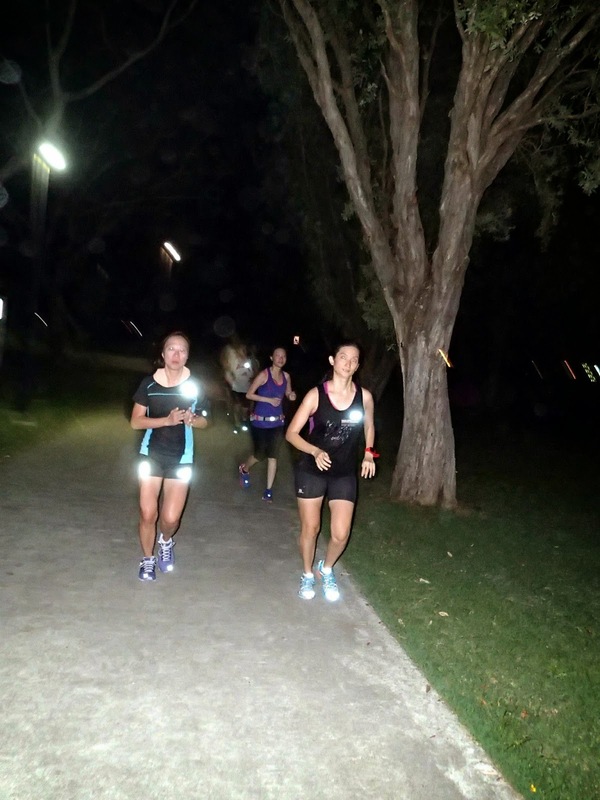 The Kookaburras were in for a longer buildup with 21km (HM) and 30km (FM) @ Optimal Pace, requiring an extra effort from the participants. The air was humid and felt heavy. 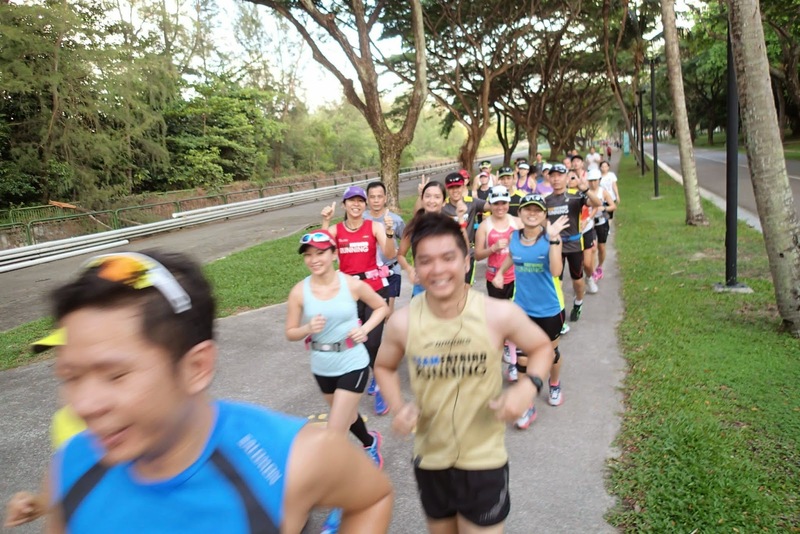 With the sun creeping up in the early part of the morning, the first 10-15km felt laboured although the pace were still being maintained fairly well. 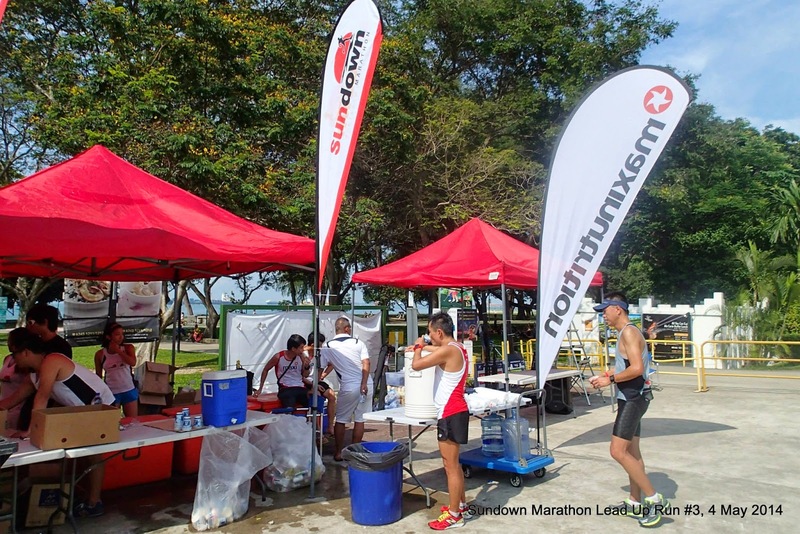 The showers at 9:00am were a welcomed relief for the tiring runners, giving an immediate boost to motivation to sustain targeted Optimal Pace. 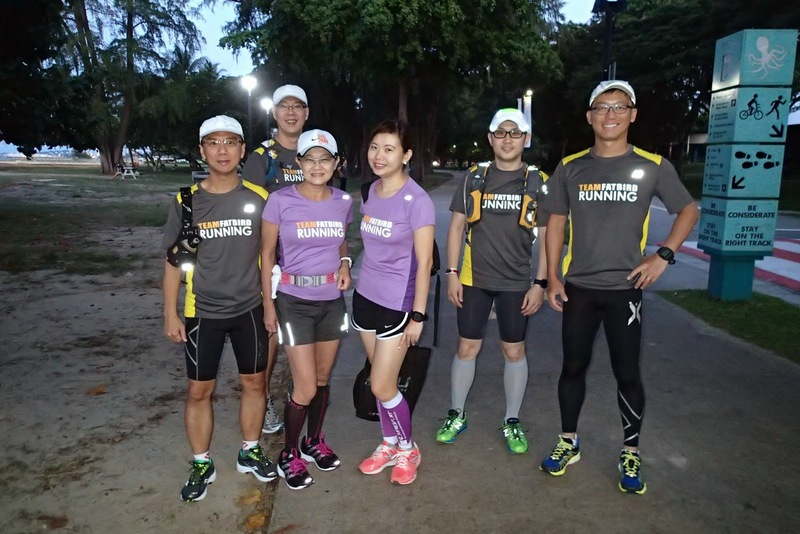 We have not run in the rain for some time before this, and it sure felt cool and refreshing with the sweats of perspiration being washed away and the rain droplets helping to cool off the runners to bring heart rates to sustainable levels. 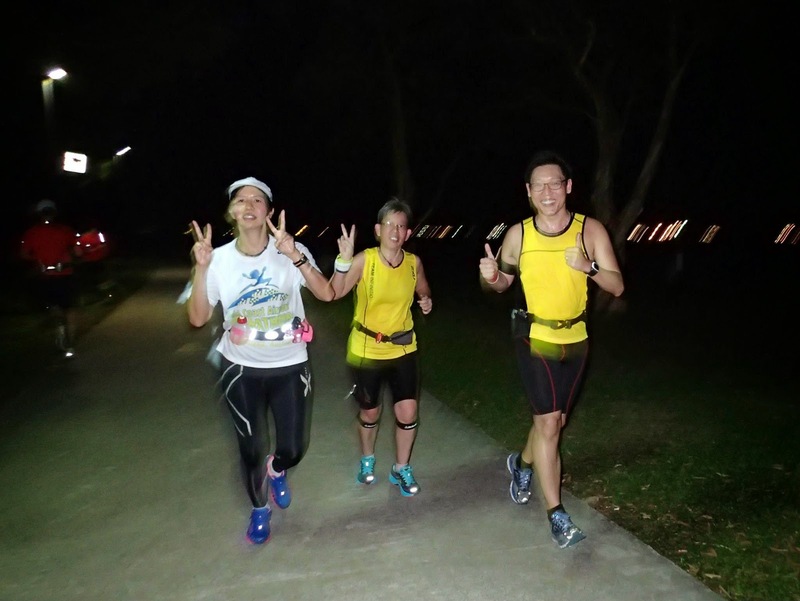 The spirits of the runners also improved with the rain, as fellow NightHawks and Kookaburras cheered and Hi-5 one another whenever they see pace groups coming from either operations. 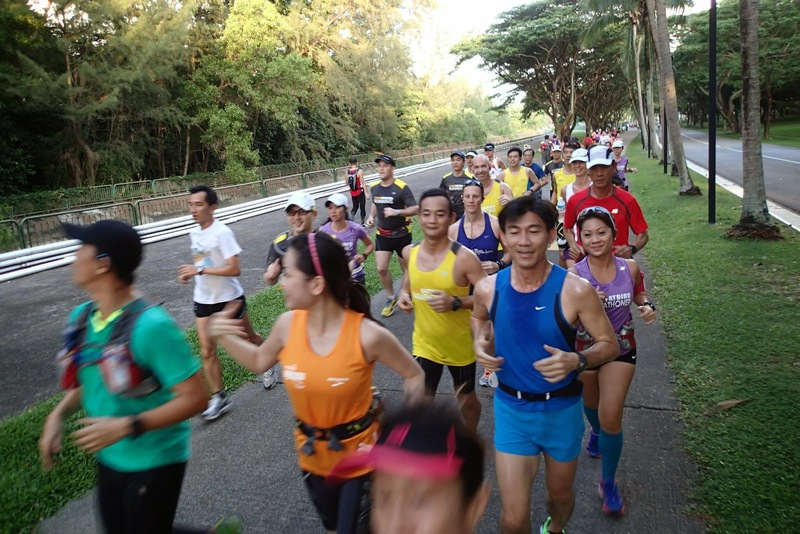 The entire workout completed slightly ahead of time – by 10:15am, every runner was back and accounted for. 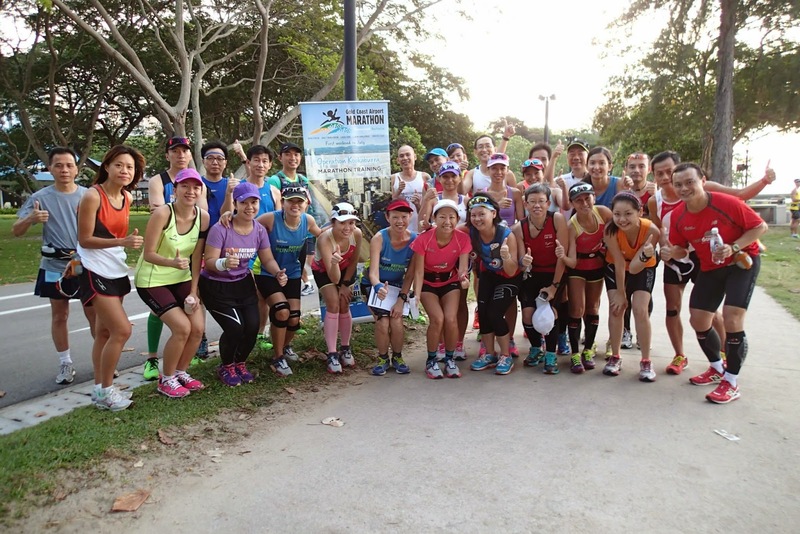 This was a very useful session where the final kinks were being ironed out, and we had a few runners who sacrificed their 10km Green Corridor or Real Run just to be able to do the 25km-30km LSD. 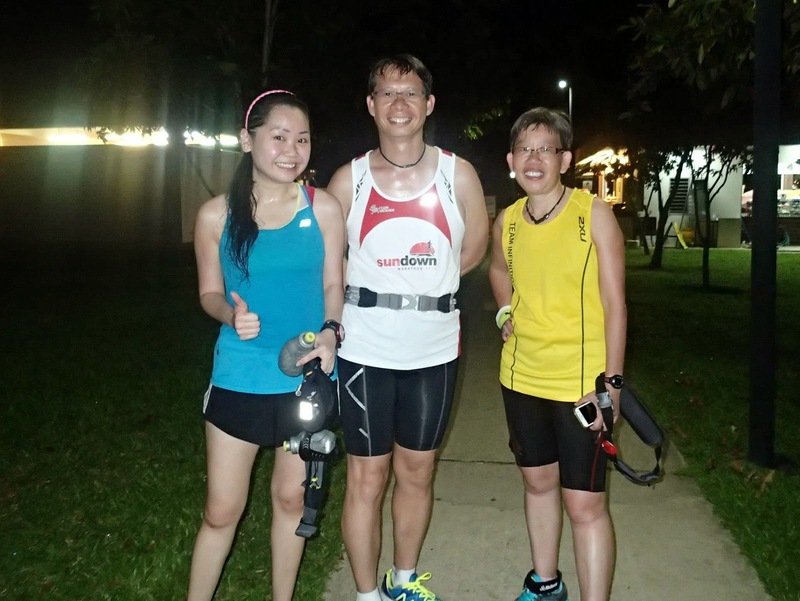 By the time the runners were leaving home, the rain has stopped and the skies cleared up – such a nice timing. The Kookaburras will have the next 2 weeks as self training. 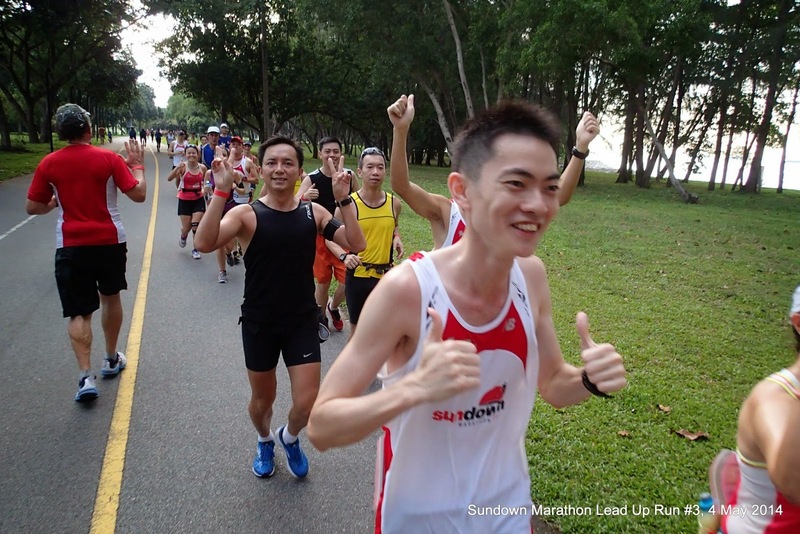 A number of them are participating in the Sundown Marathon on 31 May, using that as a time trial of sorts to gauge their chances and any improvement areas for the GCAM on 5-6 July. The NightHawks will continue into their final week of tapering with reduced long run mileage, but maintaining respective intensities and paces for their weekday tempos/fartleks and weekend LSD. Final preparations and tests of race night gear, race/hydration/fuel plans will be locked and loaded next weekend before the Race. 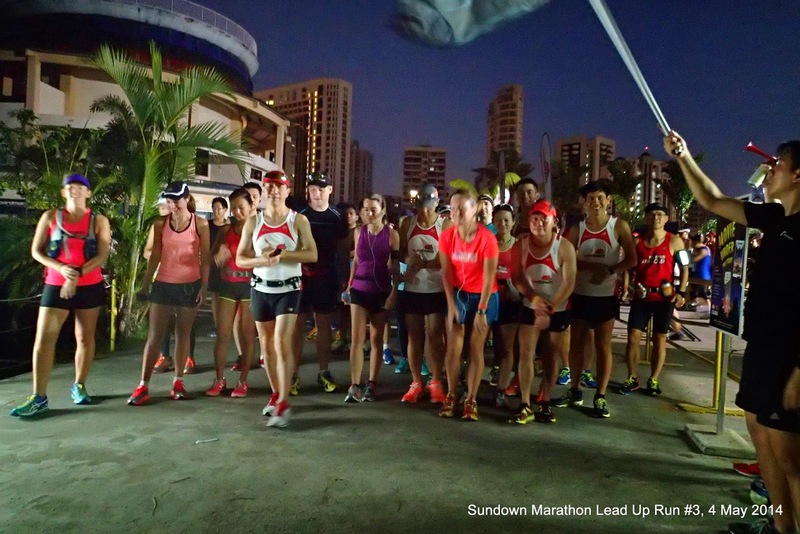 With the consistent and smooth buildup of the NightHawks, and the reasonable base established by the Kookaburras, we are confident that all trainees and Sundown Pacers will perform to expectations and achieve race timings or Pace Group targets on Sundown Race Night. 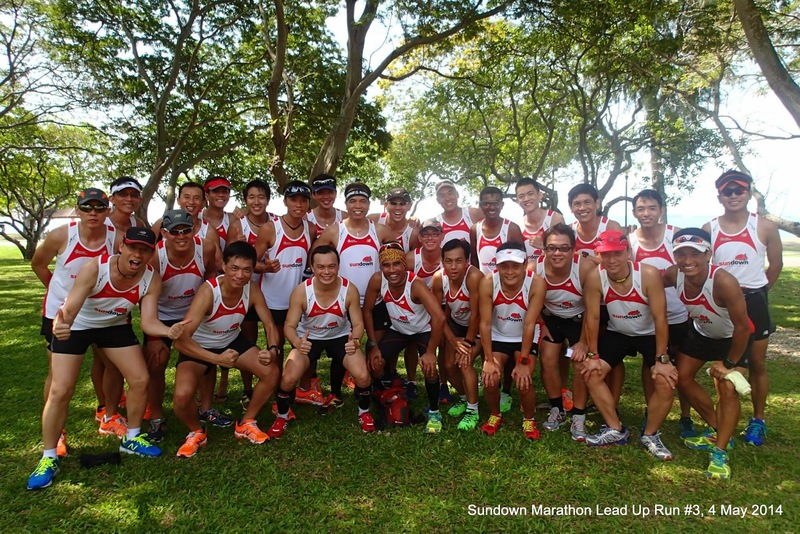 The Sundown Runners Are Ready! Bring On The Night! 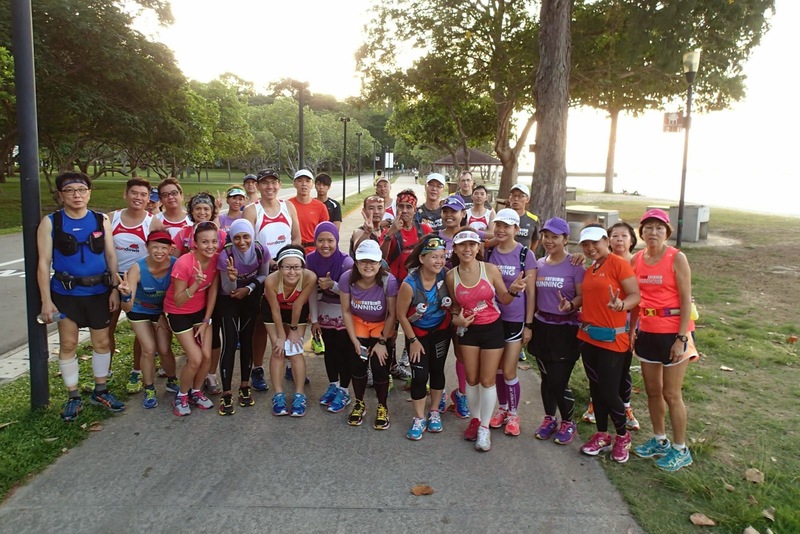 In week #5, the Ops Kookaburra participants had their third group training with Team FatBird at the ECP for Optimal Paced long runs of 18km for the Half Marathoners and 28km for the Full Marathoners. 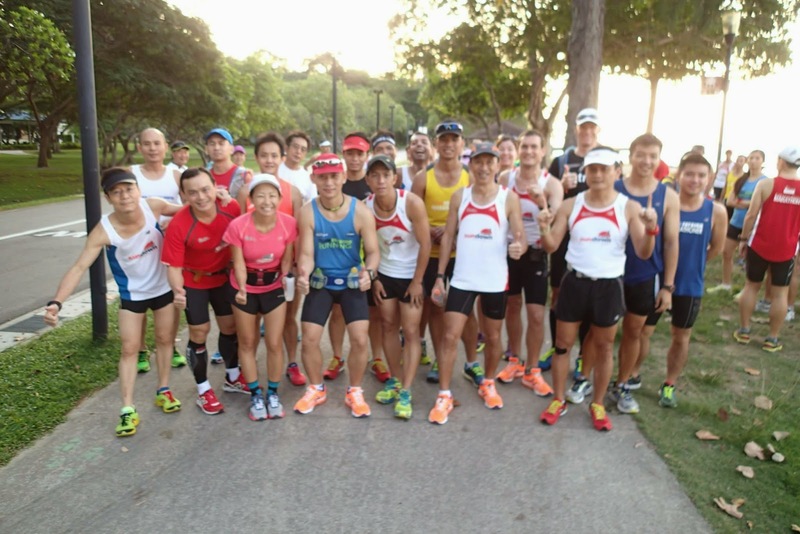 The turnout was not bad and we had the regular group of trainees settling in well to the training structure, with some firm foundation built up in the previous weeks of runs. 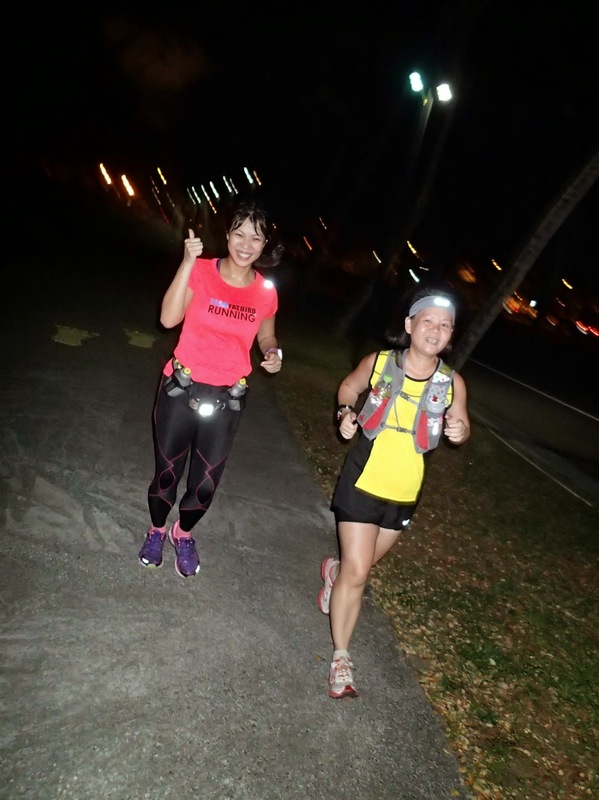 Although the run was a night one, the rather humid weather posed some challenges, especially in the second half of the workouts. Still, the Kookaburras were focused in sustaining their targeted paces for as long as possible. 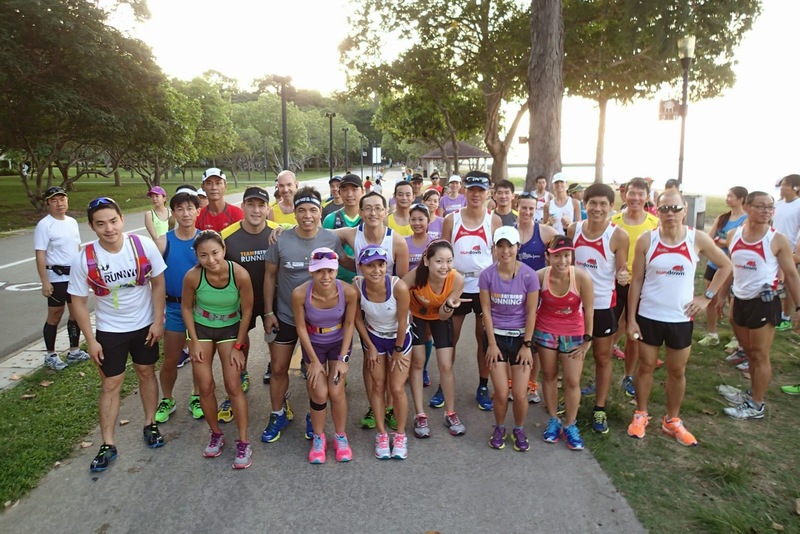 With the guidance of experienced Gold Coast Marathoners as Pacers, the Kookaburras learnt more about balancing their efforts with sustainable paces, as well as implementing some elements of good in-run fuel and hydration. 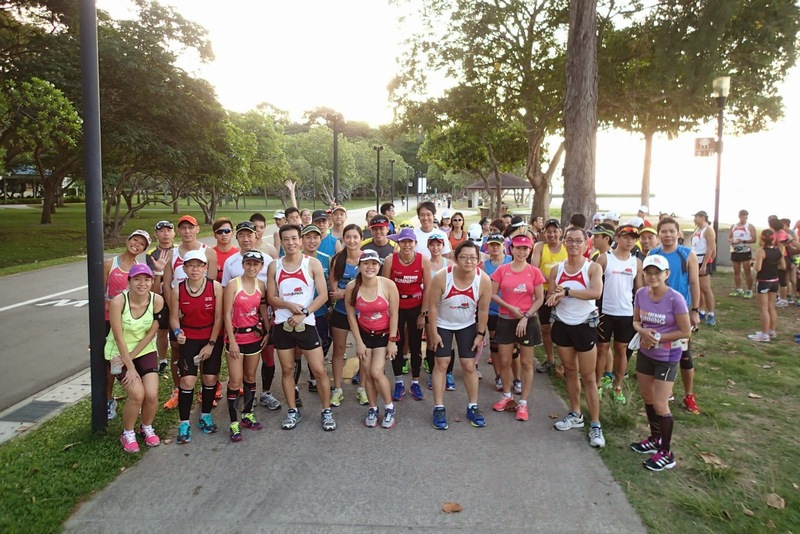 The stretch of ECP was real busy on this Saturday night, adding on to the challenge of the run as we had to weave around the crowd at times, and also be exposed to the smoke from the BBQ pits and families with children hogging the running paths. 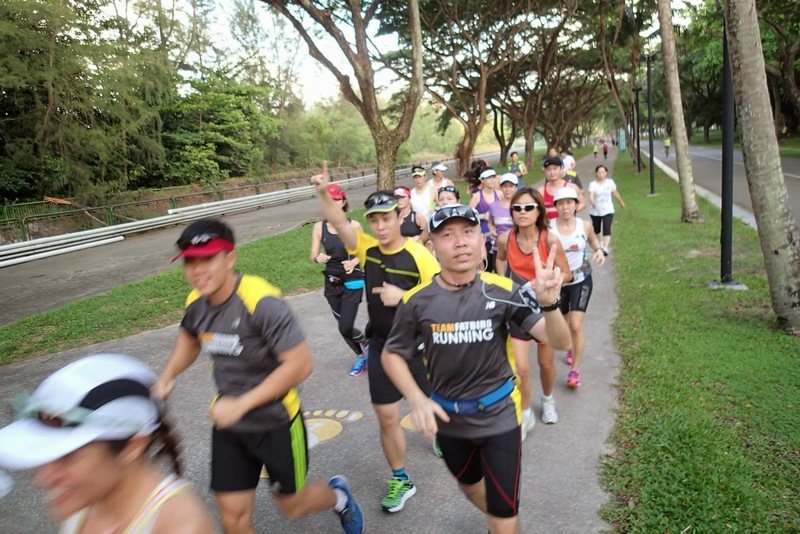 However, all the activities and merry-making added to the fun factor of the run as well as heightened the senses of our runners as we had to be extra alert to avoid any potential accidents. 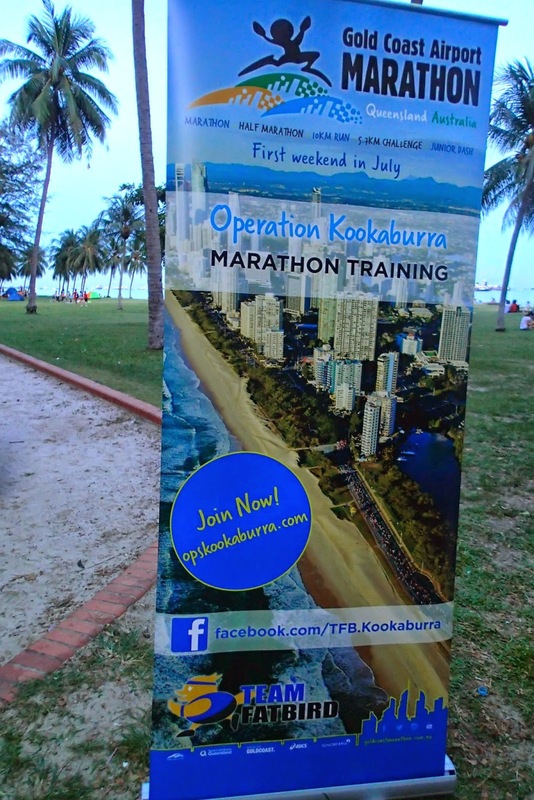 The mainly FM Kookaburras completed their 28km distance with good effort, although some had to slow down the pace after 21km as the humidity and fatigue took their toll. Still, the Kookaburras were able to continue with the remaining distances at slightly slower pace, fulfilling the overall training objectives no less. After this phase of training, the Kookaburras will embark on their next phase in week #6 at Optimal Pace (a tad faster than Marathon Pace). 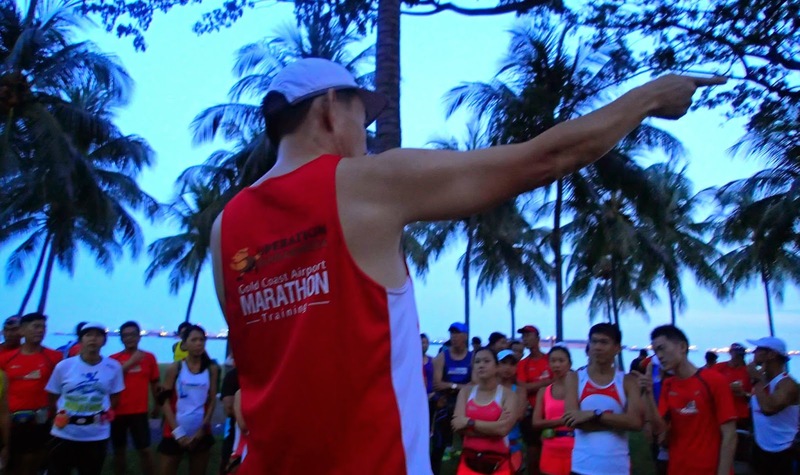 That will also prepare the runners for a trial of their abilities as some will be participating in the Sundown Marathon at the end of May. The Kookaburras are building up well even as we are having a few more participants join us for GCAM. 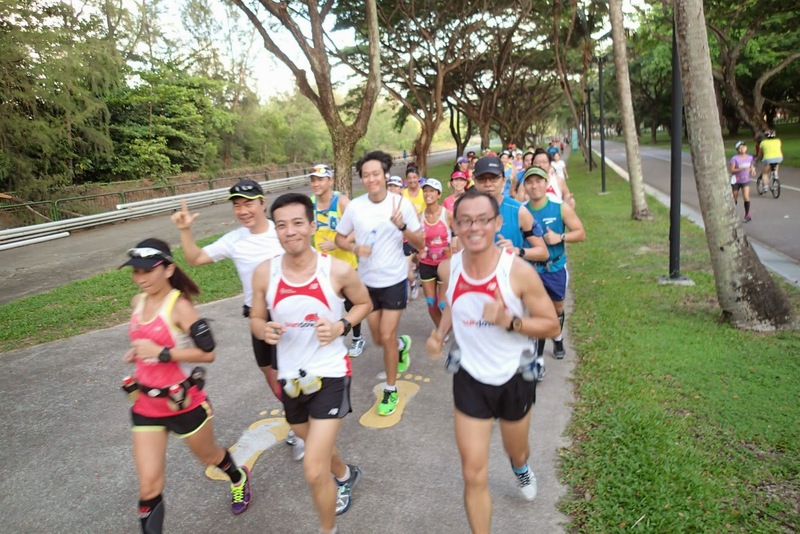 The GCAM race registrations are looking good for yet another large contingent from Team Singapore. 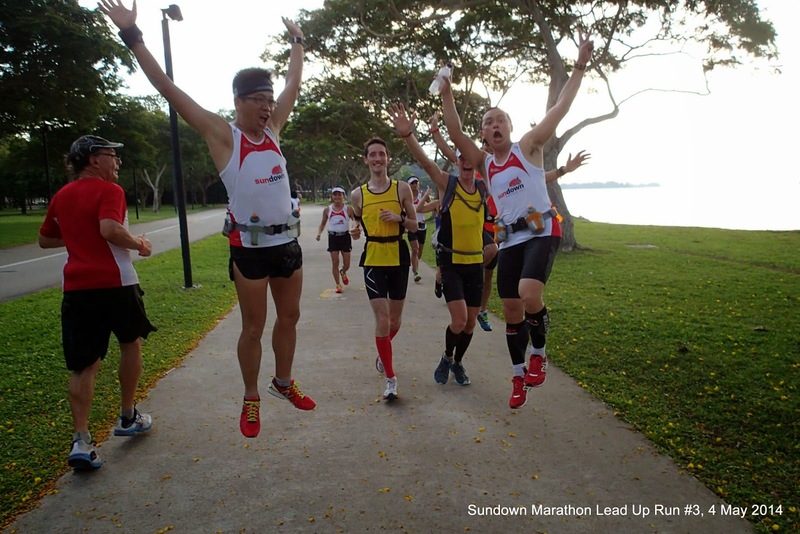 For marathoners who are still on the fence about registering for GCAM to do their Personal Bests (PB) or Qualify For Boston (BQ), there is no better time than to do it NOW – Do visit the GCAM booth at the Sundown Marathon Race Expo On May 16-18 to get more details of the travel package and possibly register in the spot. Run Kookaburras Run Kookaburras, Gold Our Race Shall Be! 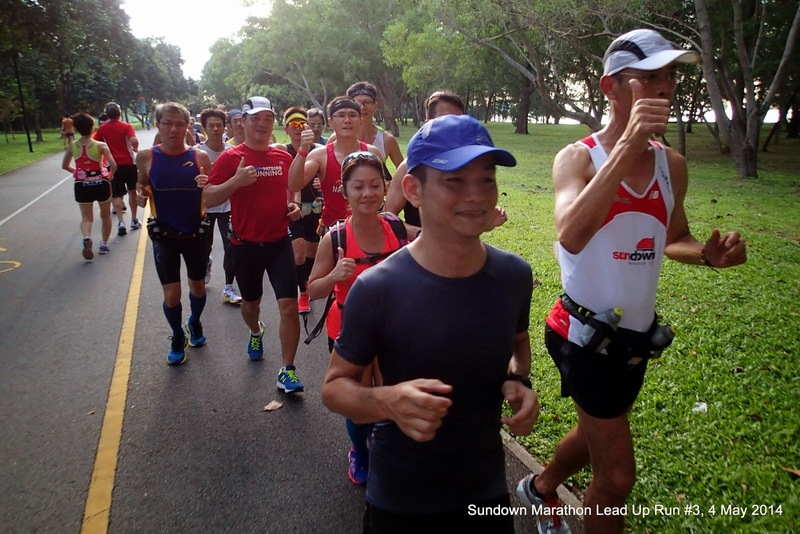 In the 3rd and final installment of the Sundown Marathon Lead Up Run series, we started way early in the morning to avoid the heat of the morning sun – but still ran smack into the challenge as the early heat made this longest LSD in the series one of the toughest training runs in recent memory. 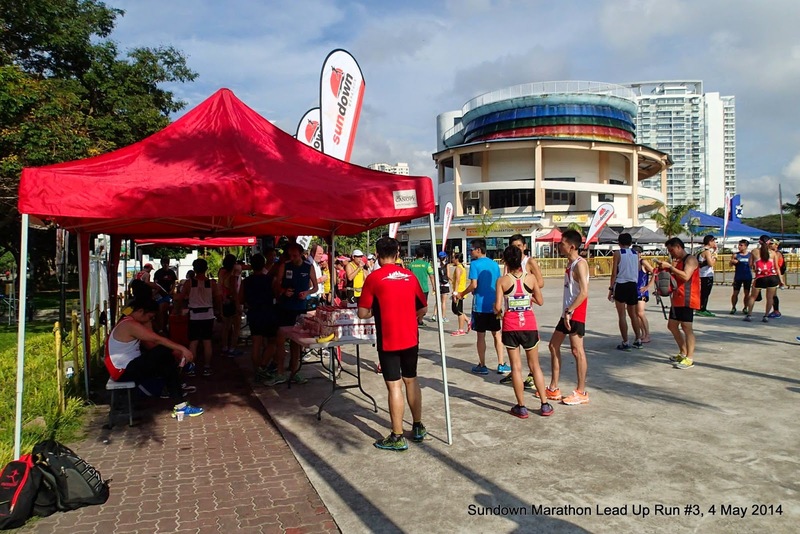 Registrations were open by 5:30am, but the crowd started to trickle in only from 6:00am, most likely due to transport (higher taxi fares and availability of buses) to the Playground @ Big Splash at that wee hour. Still, a nice group of about 300 managed to arrive by 6:15am for the training briefing for us to be able to flag off at 6:25am. 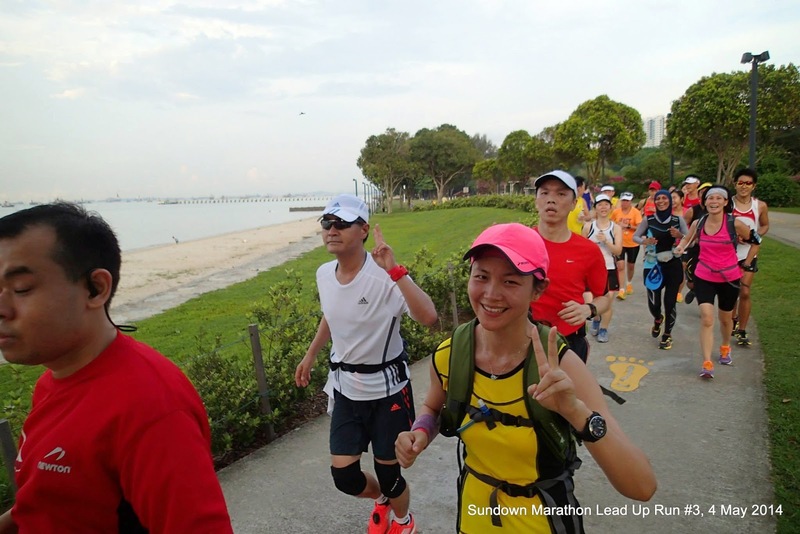 The 3rd Lead Up Run was to be executed in Optimal Pace (slight faster even pace than Marathon Pace) for the morning’s distances of 21km for the Half Marathoners and 32km for the Full Marathoners. 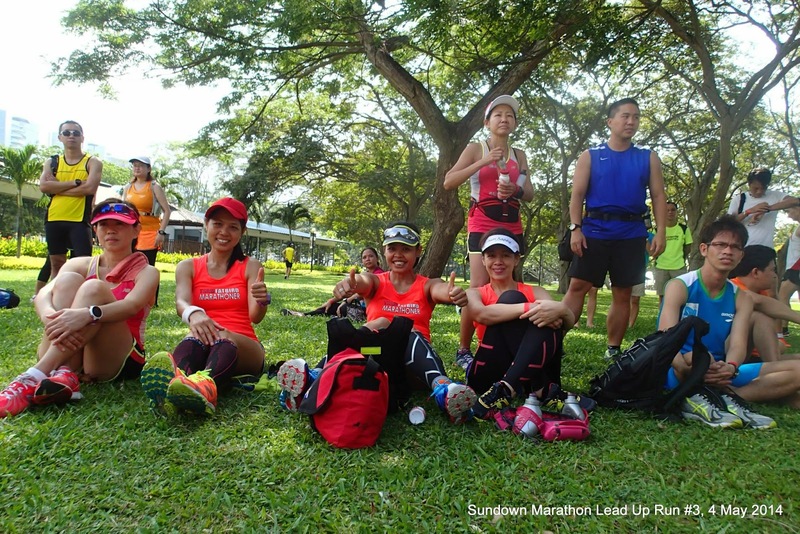 A number of the Sundown Pacers and NightHawk trainees eventually completed the maximum 35km in that grueling heat. 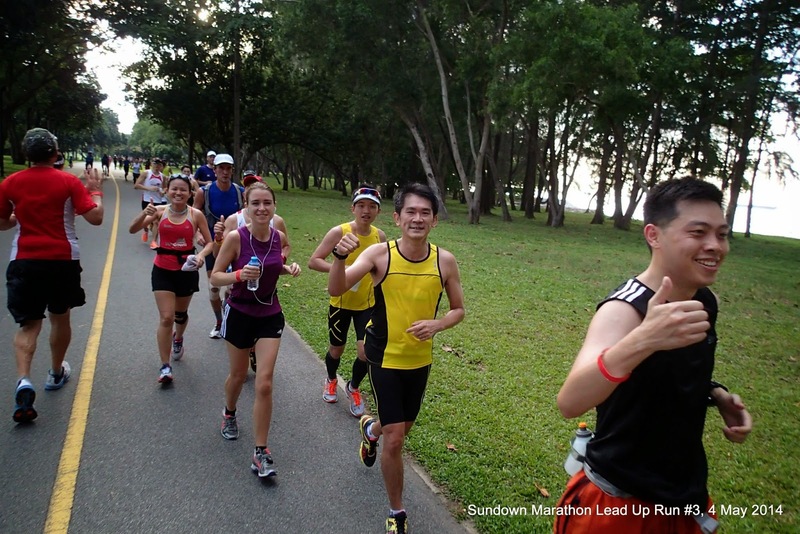 The Lead Up Runners were highly charged as this was for many the longest run in their training regime, before tapering kicks in three weeks to race night. 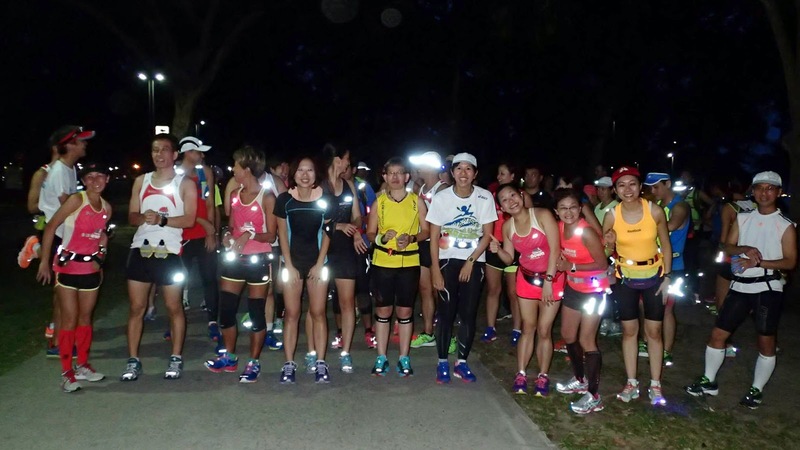 The ever reliable Sundown Marathon Pacers led the groups of runners at sustainable Optimal Paces of HM (5:34-2Hr, 6:17-2:15h, 6:49-2:30h) and FM (5:34-4:00h, 6:17-4:30h, 6:49-5:00h, 7:42-5:30h and 8:25-6:00h) groupings. 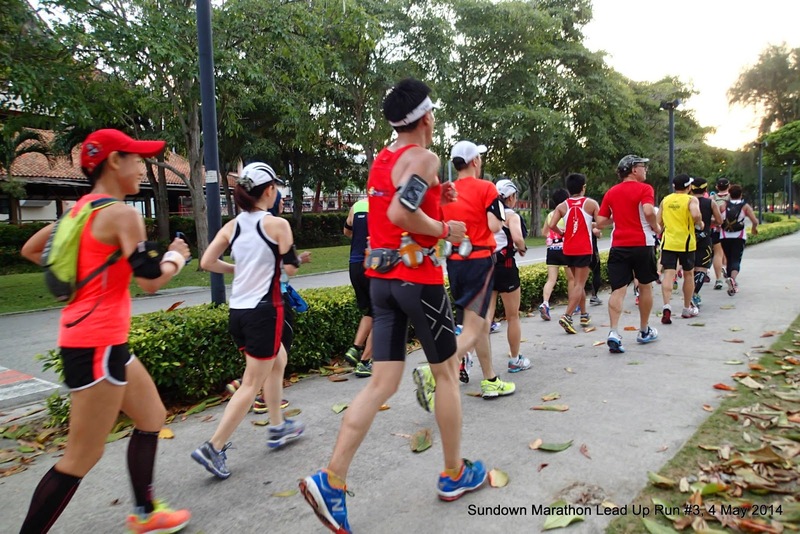 The first 12km till the Maxinutrition hydration point saw the respective groups of runners maintain very good paces and traveling in close-knit formations. A quick ‘technical’ pause of 2min were given to each group get to get hydrated before making their way back to the Playground for 21.1km. 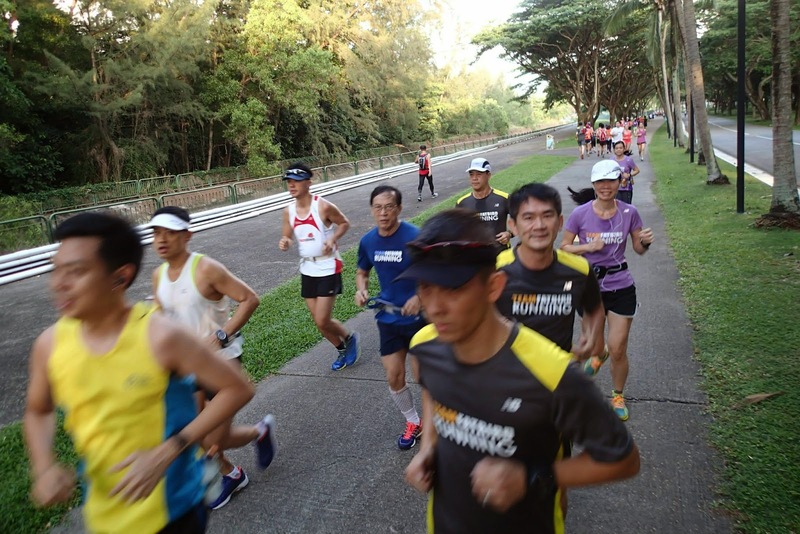 Many of the HMers did well to hit their Optimal Pace with a number able to sustain that pace for about 15-18km, which was commendable given the heat from the sun showing up in the second leg of the run. 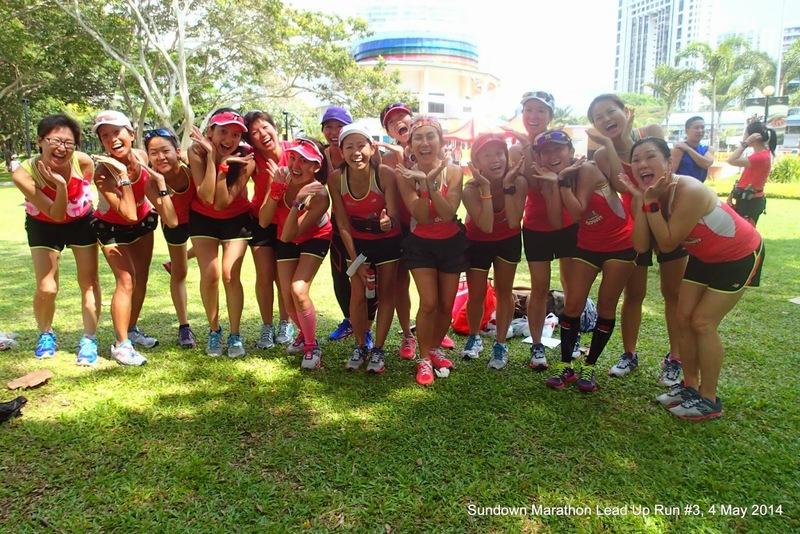 By the time the FMers went for their second leg of 11km-14km (after completion of 21km), the overbearing heat from the sun was directly at their faces. 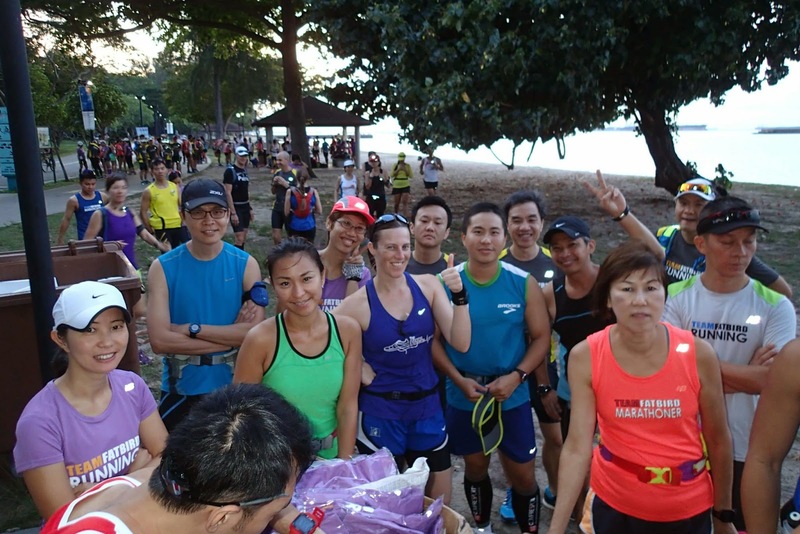 The refuel at the Playground with 100Plus and bananas provided the energy required to maintain Optimal Pace as things got tougher after 25km of running in that heat. 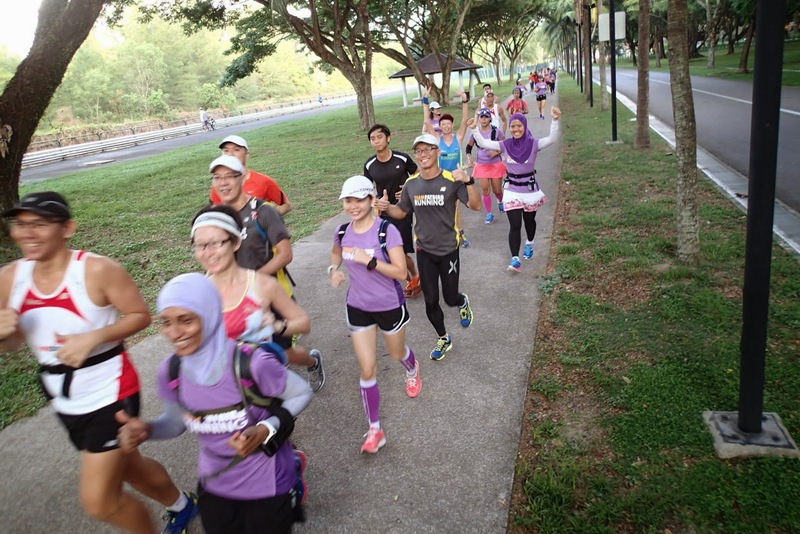 There were occasional stops at the toilets to ‘cool off’ their bodies to prevent overheating, with some of the groups adopting additional walk breaks into their usual routines – the average paces were slipping slightly, but many of the HM lead up runners held on to complete 30-32kkm of the distance. 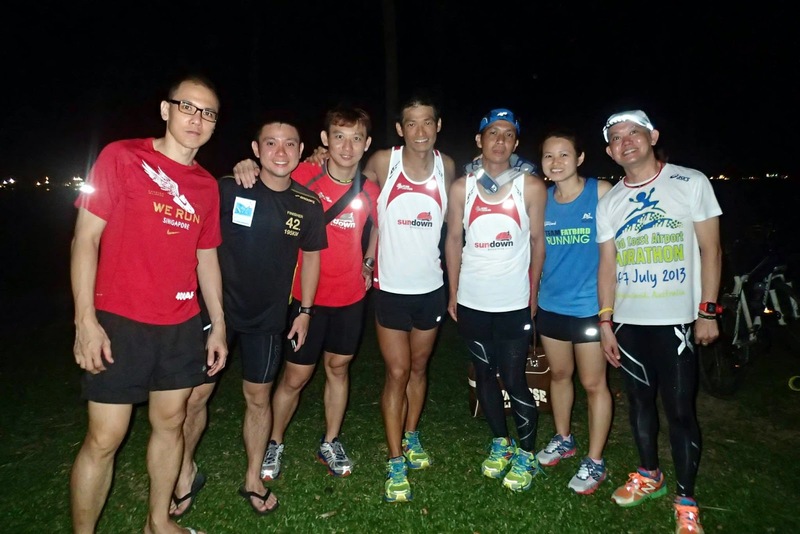 It had to be one of the toughest training runs we had encountered in recent memory. 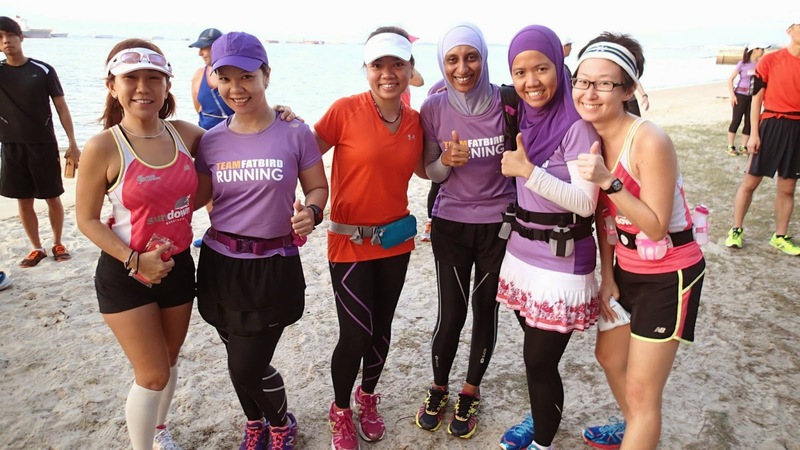 Some of the runners cut short the targeted distances but still were able to surpass their past training runs’ performances with the ability to sustain optimal pace for a good way. 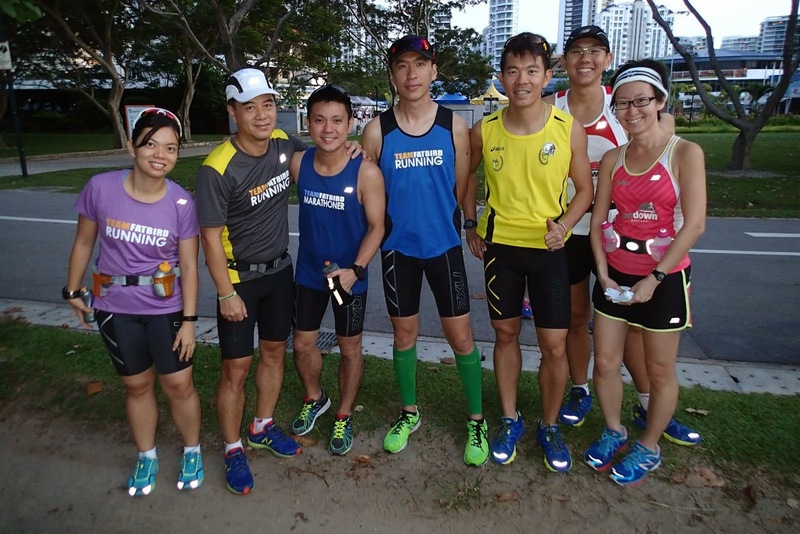 The runners were given a very insightful post-run talk by an experienced phsyio-therapist team from Tan Tock Seng Hospital, touching on the important topics of injury causes (from poor posture, running form, body makeup) and prevention (through stretching, foam roller therapy), strengthening of core and important running muscle groups, with some pre and post run stretching techniques and strengthening routines. 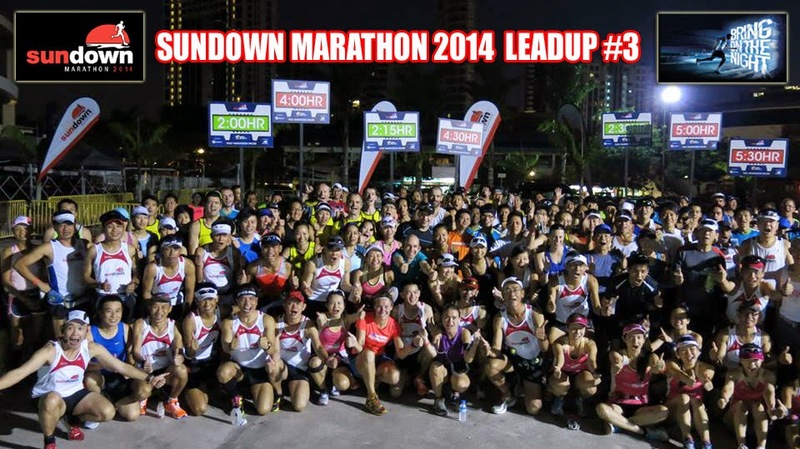 Overall, it was a very fruitful and successful final lead up run, thanks to the very dedicated setup and support provided by the Sundown Marathon organizer (HiVelocity) with the backing of the event’s sponsors. 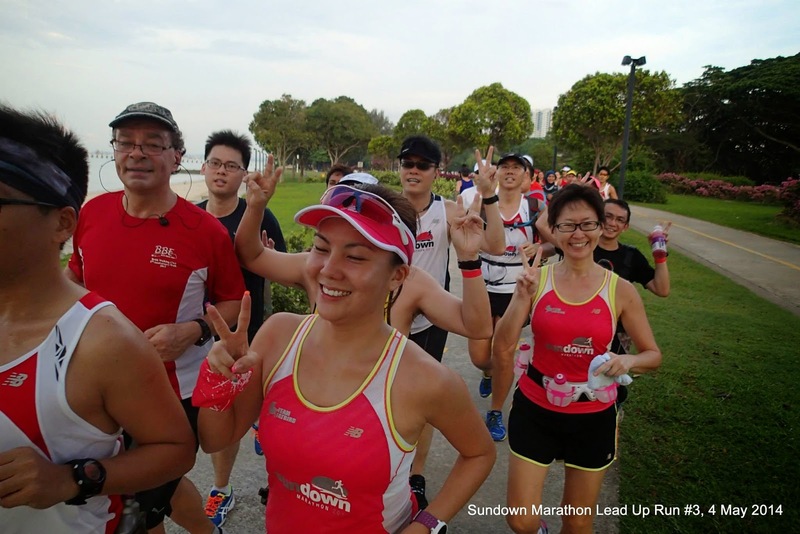 The entire Sundown Lead Up Run series concluded on a high note (temperatures not withstanding) which have benefited to the more than 700 participants who have registered and attended one or more of the 3 lead up runs. 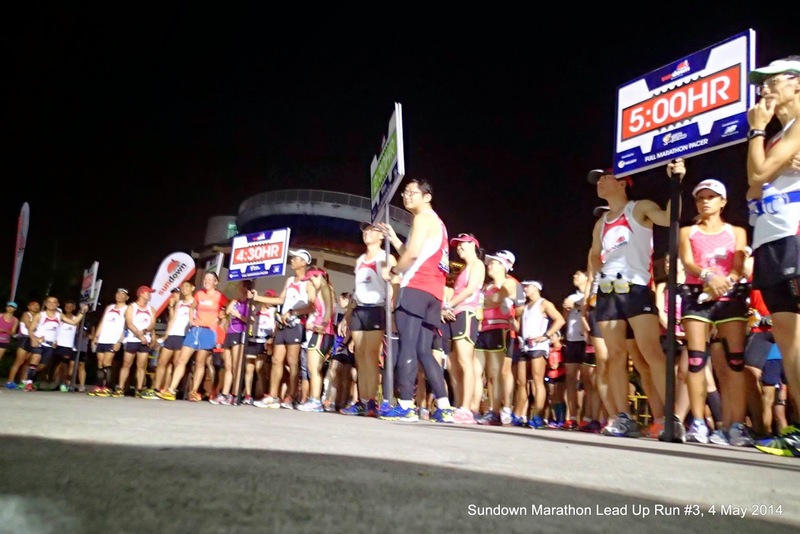 Sundown Organizer and Team FatBird have taken in feedback with regards to makeup of the training runs and start times, and will bring them to the drawing board for enhancements to the training run series of Sundown 2015. 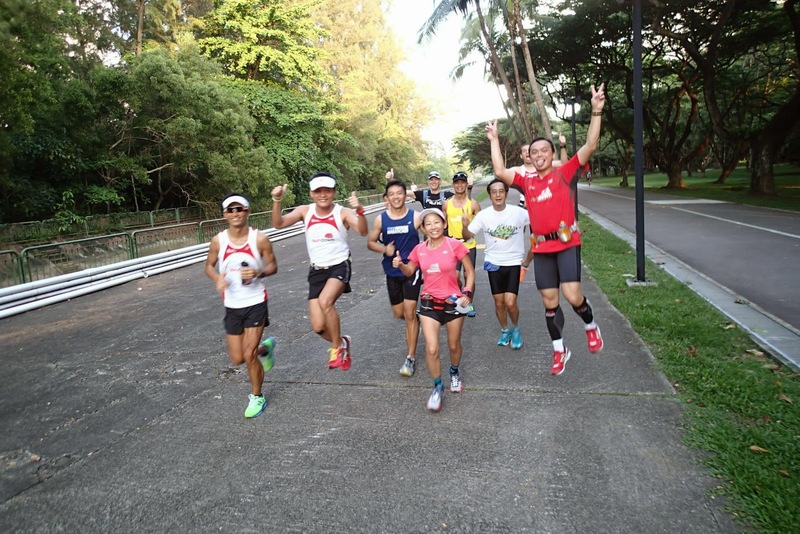 With less than a month to go to May 31 race night, we will be focusing on tapering (cutting down on the long run mileage but maintaining Optimal Pace intensity) for the remaining 3 weeks worth of training. 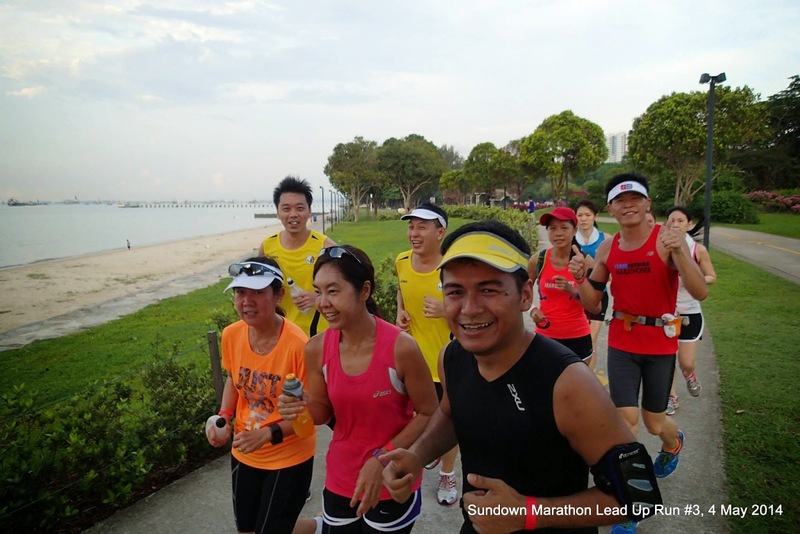 The Sundown Pacers are looking forward to bring as many Sundown Runners as possible to their race objectives and targeted finish timings. 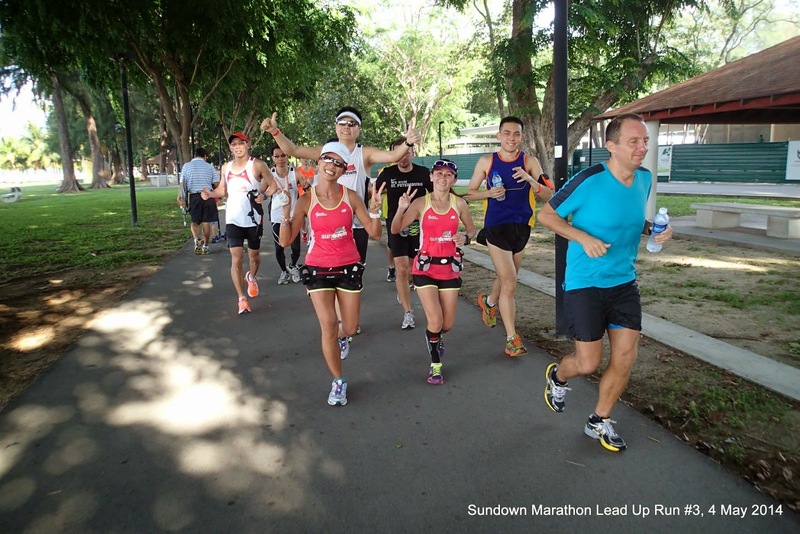 Sundown Pacers – Follow Our Pace & Win Your Race!